For the airport on the United States, see Exeter Airport (USA). Exeter International Airport (IATA: EXT, ICAO: EGTE) is an airport located at Clyst Honiton in the District of East Devon close to the city of Exeter and within the county of Devon, South West England. In 2007 the airport handled over 1 million passengers for the first time, although passenger throughput subsequently declined. In 2015 it handled 816,379 passengers, a 6.9% increase compared with 2014. Exeter has a CAA Public Use Aerodrome Licence (Number P759) that allows flights for the public transport of passengers or for flying instruction. The airport offers both scheduled and holiday charter flights within the United Kingdom and Europe. Exeter International Airport is located 4 miles (6.4 km) east of the city of Exeter and is approximately 170 miles (270 km) south west of London. To the south, it is connected by the A30 dual carriageway which can be accessed from the east and the M5 in the west, just 1.5 miles (2.4 km) away. The M5 enables good links with Bristol and the Midlands. There is no railway station at the airport, and the closest station is Cranbrook (Devon) railway station which is 2.5 miles away. Exeter St Davids railway station has a bus link and is therefore easier for passengers using the airport. Exeter Airport was opened on 31 May 1937 and operated from a "tented" terminal before the permanent buildings were complete. Jersey Airlines immediately inaugurated a summer service of eight flights per week from Jersey in de Havilland DH.84 Dragons. Railway Air Services ran connecting flights on to Plymouth and Bristol. 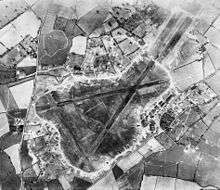 Aerial photograph of RAF Exeter, 20 March 1944. In World War II RAF Exeter was an important RAF Fighter Command airfield during the Battle of Britain. RAF Exeter was used by the United States Army Air Forces (USAAF) Ninth Air Force as a D-Day troop transport base with Douglas C-47 Skytrain transports dropping paratroops near Carentan to land on the Normandy Beachhead. It was known as USAAF Station AAF-463. Despite efforts at camouflage, including painting the runways, Exeter attracted the Luftwaffe and administrative and technical buildings were destroyed. Exeter met the requirement of basing USAAF troop carrier groups close to where units of the 101st Airborne Division were located and within reasonable range of the expected area of operations. 5 June 1944 photograph of C-47s of the 95th and 98th Troop Carrier Squadrons at RAF Exeter with freshly applied black/white invasion stripes to aid in aircraft identification from the ground. There was insufficient space to park all the aircraft on the concrete, so many were parked on grass turf. The 440th Troop Carrier Group arrived on 15 April 1944 with over 70 C-47/C-53 Skytrain aircraft. There was insufficient hardstandings to accommodate all the aircraft so many had to be parked on the turf, some areas being supported by tarmac. 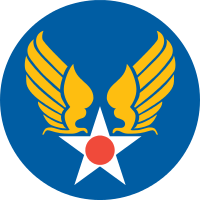 The 440th was a group of Ninth Air Force's 50th Troop Carrier Wing, IX Troop Carrier Command. The 98th TCS remained at Exeter until 7 August when it began operating from RAF Ramsbury. On 11 September the headquarters of the 440th TCG was established at the group's new base at Reims, France (ALG A-62D), and the last of the air echelon left Exeter two days later. Walruses of an RAF air-sea rescue flight were the next tenants and these were joined by a glider training unit early in 1945. Post-war, Exeter was reclaimed by Fighter Command and a French Supermarine Spitfire squadron, No. 329, which came and stayed until November 1945. Meteors and Mosquitos made a brief appearance the following spring. No. 691 Squadron's target-towing Vultee A-31 Vengeances, which had been present for more than a year, proved to be the last RAF flying unit of the Second World War period based at Exeter. When No. 691 Squadron departed in the summer of 1946, the station was made available for civil use, being officially transferred to the Ministry of Civil Aviation on 1 January 1947 although there was still some reserve RAF activity until the 1950s. Scheduled services to the Channel Islands began in 1952 and charter flights to various locations followed. A new terminal building was opened in the early 1980s and various other improvements, including a runway extension, were carried out over following years to establish Exeter as an important airport in the West Country. Exeter was a joint RAF/Civil airfield in the 1960s. 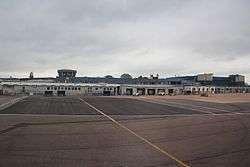 On 5 January 2007 a majority share of the airport was sold by Devon County Council to Regional and City Airports Ltd, a consortium led by construction firm Balfour Beatty. On 26 June 2013 the airport was bought by the Patriot Aerospace division of Rigby Group, which also owns Coventry Airport. In August 2016, Exeter Airport recorded their highest passenger throughput in a single month since September 2008, with 100,374 passengers passing through the terminal. New services to Glasgow and the first route to be supported by the new Goverment Regional Air Connectivety fund to Norwich, contributed to a 19% increase in passenger numbers during the month of August. Flybe headquarters and primary maintenance facilities for inhouse and third party customers are housed at Exeter, with maintenance bays for up to 8 aircraft simultaneously. Capital Aviation is based at Exeter and offers a number of commercial services. The company have a fleet of turboprop and jet aircraft, including the Beech 200 Super King Air and Leajet 45. These aircraft are mainly used on a private hire/charter basis. Capital also provides emergency medical transport and cargo/mail services. There are two flight training organisations based at the airport: Aviation South West and Airways Flight Training. These two FTO offer a range of training from the Privates Pilot Licence to the Commercial Pilots Licence and Instrument Rating. Devon Air Ambulance and NPAS National Police Air Service share a purpose built facility on the northern side of the airfield, having vacated the Police Headquarters at Middlemoor, Exeter in 2014. ↑ "RAF Exeter". South West Airfields Heritage Trust. Retrieved 5 July 2016. ↑ "Exeter International Airport sold to Rigby Group PLC". BBC News. 27 June 2013. Retrieved 27 June 2013. ↑ "Best month for passenger numbers in 8 years". Exeter Airport. 31 October 2016. Retrieved 31 October 2016. 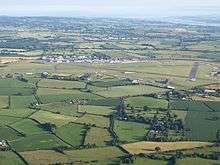 ↑ "New helicopter base for Devon police and air ambulance service". Exeter Express & Echo. 12 May 2014. Retrieved 12 May 2014.